This is a fine example of Migeon's 1876 map of the european parts of Turkey. The map covers from Moldova to Thessaly and from the Adriatic to the Black Sea. Greece and the island of Candia or Crete is also included. This map, drawn when the Ottoman empire controlled much of the region, covers what is today Greece, Turkey, Macedonia, Albania, Bosnia, Serbia, Croatia, Bulgaria, Montenegro, and Moldova. This map depicts the waning years of Ottoman hegemony in the region. The Greek Independence movement attained sovereignty for the Peloponnese in 1821. 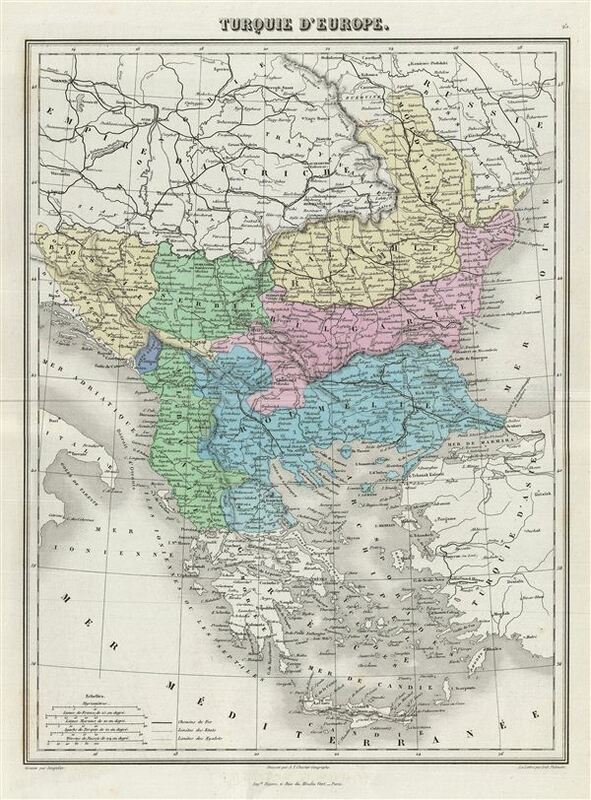 The other Grecian and Balkan states, including Serbia, Croatia, Moldavia, Wallachia, Albania, and Macedonia, remained at least nominally under Ottoman control until 1878. Divided and color coded according to regions and territories, the map identifies various cities, towns, railway lines, islands and an assortment of additional topographical details. This map is issued as plate no. 25. Very good. Original centerfold. Balnk on verso.